Muny Memories Exhibit at the Missouri History Museum. Enjoy 99 seasons of the largest and oldest continually operating outdoor theatre in the nation. See website for more info. This exhibit is FREE! 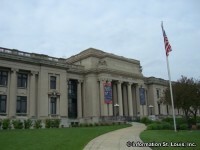 The Missouri History Museum is located in Forest Park in St. Louis, Missouri. The Museum has several continuing exhibits that feature the 1904 World's Fair, the past history of St. Louis and a Charles A. Lindbergh display. Special exhibits change many times throughout the year. Special events, such as concerts, theatre, and lectures, are also held at the museum. Directions: Located in Forest Park, on Lindell Blvd at DeBaliviere Avenue.